Soi 38 has previously been a pop-up but now we've settled down. Our menu is nice and easy and super delicious, boat noodles or tom yum noodles. Choose from dry, soup or krua krik (half soup) and select from our wide range of noodles. We are open Monday to Saturday from 11:30 to 3 (unless sold out) and closed on Sunday. Soi 38 is synonymous with street food in Bangkok as it is one of the most famous and most popular locations where some of the best street food can be found. Soi means side-street in Thai and rather than naming all the side streets off a major road they are simply numbered, hence Soi 38. 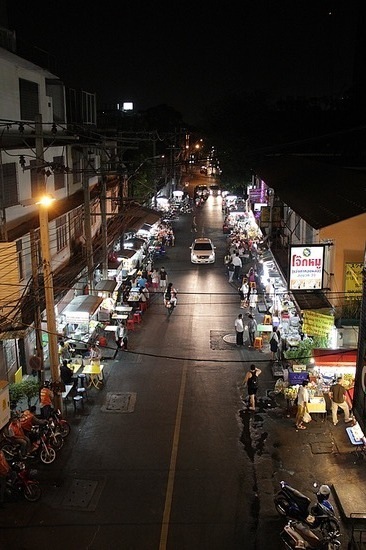 At night Soi 38 literally transforms into an open air food court crowded with stalls, tables and customers while at the same time the street is still open to cars who use it as a kind of drive through as they order take away through their car windows. One of the best things about Thailand is the food. It is not only delicious, but it is also plentiful and cheap. Much of Thai culture expresses itself through food and it is central to all occasions and celebrations. Walking down almost any street in Thailand you cannot help but be struck (sometimes literally) by the variety and abundance of street food stalls. The streets and footpaths of Thailand have a different meaning to the West where they are just for walking and driving, in Thailand the space is divided up and used for the population to sit down and socialise and eat and drink together. The convenience for the customers is pretty obvious but the vendors also have a great sense of camaraderie with their fellow stall owners creating their own highly sociable micro community as they chat and joke to each other constantly. There is absolutely no better way to absorb the Thai culture than to pull up a stool at a street food stall and enjoy some of the world tastiest cuisine food while you absorb the ambience of Thailand. Thai Boat Noodles (kway teow reua) are a delicious and intensely flavoured but little known traditional Thai dish. They are associated with central Thailand, and are so called because they used to be sold from small boats along the canals and rivers. These days the vendors have moved onshore and the most famous boat noodle restaurants are found in 'boat noodle' alley near the Victory Monument in Bangkok. Each bowl of Boat Noodles starts out with a mound of delicate rice vermicelli noodles and a scattering of water spinach and crunchy bean shoots. Added to this is a trio of gently heated sliced rump, tender braised gravy beef and a springy pork ball. The bowl comes to life with the addition of the complex broth exuding notes of cinnamon, soy, star anise, lemongrass, galangal and pandan and more. The finishing touches are then applied with a touch of garlic oil, a few sprigs of fragrant coriander, a sprinkling of finely sliced spring onions and some crunchy fried pork crisps. Make sure you customise your Boat Noodles using the condiments of fish sauce, white sugar, crushed dried chillies and chillies in vinegar to achieve your personally preferred combination of the four pillars of Thai cuisine – salty, sour, sweet and of course spicy! Thai Boat Noodles leave their more well-known South East Asian counterpart, Vietnamese Pho in their wake. Unfortunately Thai Boat Noodles are just not very well known in Australia, it is my dream that Soi 38 will be one of the first small steps in changing that. At Soi 38 we first fell in love with Boat Noodles but we have since discovered many of the other wonderful Thai noodle soups (Kuay Teow) and we plan on spreading the word about these sublime taste sensations as far and wide as possible!